Adapting The Bible into a television miniseries that resonates with a fickle 2013 audience is a daunting task. But if anyone is up for it, it's Mark Burnett, the man behind mega-hits like "Survivor," "The Voice" and "The Apprentice," and his wife Roma Downey, star of the beloved series "Touched By An Angel." The husband-and-wife duo teamed up to produce an epic, 10-hour miniseries simply called "The Bible." It debuts on History Television and The History Channel on Sunday, and will air in five two-hour chunks. As if that wasn't a big enough project (they've been working on it since 2009), they also decided to release a companion novelization of the series called "A Story of God and All of Us." HuffPost TV caught up with Burnett to chat about the experience of bringing The Bible to life, including meetings with faith leaders, casting the role of Jesus and whether the intense experience tested his marriage at any point. I love that you and Roma came up with the idea for this project over a cup of tea -- can you tell me a bit more about that moment? Everything is solved over a cup of tea. Our entire falling in love, Roma and I, was in the kitchen over cups of tea. So it's very fitting that's how we discussed Roma's idea of doing a grand narrative of the Bible. Initially I was saying, "Roma, this is really daunting. Do you understand the amount of work? This will take years." She said, "I know, but we're really good at our jobs, we've made a lot of television, and we have an obligation to do a great job with this and I think we should do it." I thought about it, and that same day in 2009 we agreed to do it, and we have never looked back. Did either of you have any concerns about how working together might impact your relationship? No, but friends said, "You guys are such a good couple and you're such good friends, but this could be really bad for you!" [Laughs] But honestly, we are such good friends, and we get along so well. We actually have become better buddies and more in love over the last four years. I never thought that could be possible. I read that you met with various faith leaders from different denominations. Yes, from the very beginning before we even started scripting with the writing team, we started talking to faith leaders and tried to understand how to put this together. We had them read scripts and watch rough cuts and we formed real relationships based upon just wanting to do a great job. Upon first contact, the faith leaders were so hopeful because of the amount of commercial success we've had with [other] big series, that we'd be able to reach a whole new generation. They were very helpful to us. It helped shape the series immensely. There's been a universal enjoyment of it, across denominations I might add. So we have a very prominent Catholic Cardinal, Cardinal Wuerl from Washington D.C., who is right now at the Vatican -- he screened all 10 hours and wrote an endorsement. And then [Pastor] Rick Warren has endorsed it, Bishop Jakes, [Pastor] Joel Osteen, [Reverend] Samuel Rodriguez, and the team at Crossroads in Canada. Probably 50 or 60 major endorsements. Were you ever apprehensive about how faith leaders might react to you taking on a project such as this? The question is very logical, but oddly enough, no. We felt called that we should do this. We never looked back on this. Certainly from Roma's perspective, she starred for 10 years on "Touched By an Angel," and it's still on every day. People knew Roma very well from that. And from my perspective, just because people go to church doesn't mean they don't watch "The Voice" or "Survivor" and "Dragon's Den." It was a great combination of Roma plus Mark, the Bible, a good-sized budget and giving ourselves years to focus on it. I would imagine a project like this would be quite logistically challenging, as would a project like "Survivor." How do the two compare? Logistically, "Survivor" and "The Bible" are about the same. They both involve a crew of hundreds. They both involve an extremely remote location. I've shot on every continent except Antarctica for "Survivor," for months and months at a time. The casting was all done out of London. 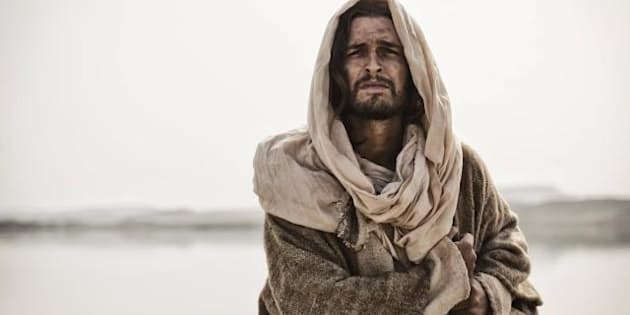 Clearly, certain roles were critical, in particular, Jesus -- who was portrayed by Diogo Morgado, a beautiful Portuguese actor. He's a large guy, he's 6'2" or 6'3". We showed Jesus as the lion and the lamb. I think some productions have taken the word 'meek' to mean 'weak.' We didn't believe that, and we didn't show Jesus that way. Loving, of course. He's the son of God. But also a sense of enormous strength. Roma played Mary, the mother of Jesus, which was also a beautiful performance when you see her pain during the crucifixion and the trial. And many other fine actors, three of them were in "Game of Thrones." It's a great cast. How did you come up with the title, and did you ever consider calling it anything other than "The Bible"? We did. The title of our book is The Story of God and All of Us. We thought about that for the series. We eventually realized, keep it simple. "The Bible." And explain it's not the entire Bible. As Cardinal Wuerl said, it's a great introduction to the Bible. What do you hope people will take away from watching it? I think some people will find great comfort and would either connect or reconnect with the Bible. Other people, who have never read the Bible or considered the Bible, will learn these stories. I think there is a sense of biblical illiteracy, both in Canada and in America, to the point with some young people that it's almost embarrassing. A lot of them don't know the basic stories. It's not saying that everybody has to go to church. Just knowing the stories. Could you imagine being a young Canadian and you don't know any Bible stories, and in some business meeting someone says oh, it's like David and Goliath or oh, it's like Samson, and you're like who's that? You'd seem stupid, right? Is there anything else you think viewers would be interested in knowing? I think it's beautiful that Hans Zimmer and Lisa Gerrard reunited for the first time since "Gladiator." It was important to have beautiful music; an epic, sweeping score. When you're doing Genesis to Revelation in 10 hours, the music is the connective tissue. "The Bible" premieres on History Television and The History Channel on Sunday, March 3 at 8 p.m. EST/ PST. It will also be available on Blu-ray, DVD and Digital HD on April 2.